Since I was really happy with how baby Jack's nursery turned out, I decided in February to direct my cooped up 'it's-winter-and-everyone's-sick-and-I-just-had-a-baby-and-we'll-never-be-able-to-leave-this-damn-house-again' energy towards some other projects, starting with the little boys' room. Clyde and Will have shared this room for about three years, and some of the animal decor was from baby Clyde's nursery five years ago . . . so I was kind of over it. I wanted their room to be a little brighter and a little more reflective of them instead of the generic (albeit very cute!) feel it seemed to have. So naturally we had to incorporate some Star Wars. I painted four 8x10 canvases and then ordered white vinyl decals through Amazon. 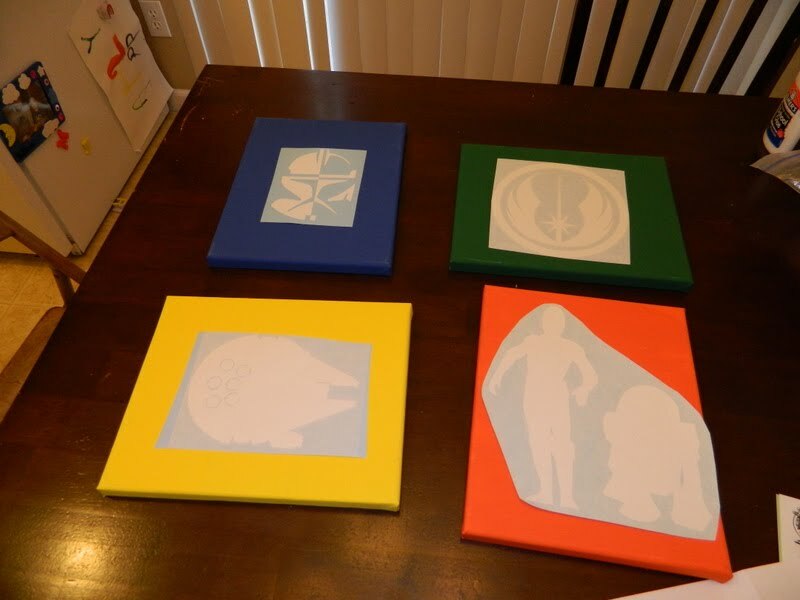 And here they are - the Jedi symbol on green, a clone trooper helmet on blue, the Millennium Falcon on yellow, and C-3PO and R2-D2 on orange. One my favorite songs to sing to the boys is 'You are my sunshine' and Will especially loves it so I thought it'd be fun to put that in their room. I bought a 16x20 inch canvas and used the same process as the 'I am a child of God' from Jack's room; it was much easier this time around. 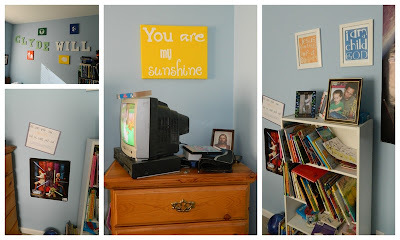 For over their bookcase, I found a couple free printables - they're hard to read but one says 'Jesus wants me for a sunbeam' and the other says 'I am a child of God'. And I've completely given up keeping that bookcase organized. I had an old collage picture frame in the closet, so I pulled it out and painted the frame blue and then added the 'We are a happy family' personalization on the mat. This finishing touch in their room was just added last week and Will immediately embraced it. No more arguing about reading books before scriptures, yaaaay! I also ordered a bunch of pictures of my babies for this frame that I've had sitting around (empty) for like a year and put it up in the hallway outside the boys' room. Be prepared: I make everyone who comes into my house come take the 'quiz' and try to identify each baby. The other big inside project I undertook was the silly plant shelf that runs along my living room. We've been in our house just shy of four years, and it's taken me that long to get the motivation to figure out what to do with the dang thing. I'm not a fan of fake plants, I'm not a fan of watering real plants and I'm not a fan of just sticking things up there that I don't love just so it's filled. Hence the delay. Here's the progression - started out completely empty, the wrought iron piece went up immediately, the two tiles went up December of 2008 and that's as far as we had gotten until the last two months. Inspiration struck when I found the tall vase and the tree picture at Family Dollar (I love that place, even if it's not actually a 'dollar' store) in February. 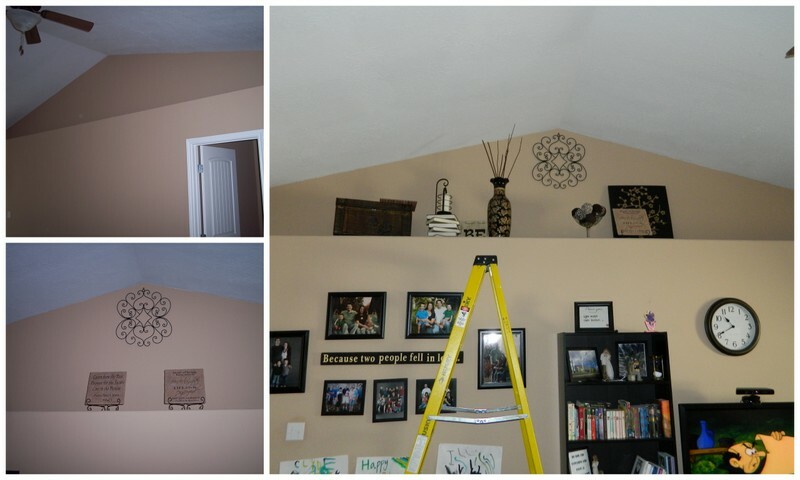 I decided to keep it all black/brown/tan up there, and everything else came together. I already had the trunk and the small chest from my Rite Aid days . . . The candle lantern was a Savers find, as was the glass container for the yarn balls (which were courtesy of myself, some glue, and a few late nights). The candle (and the sticks for the vase) were stolen from Nicole. I ordered the dove/hands print from Costco (they have hundreds of amazing art prints online for awesome prices - this 12x12 print was $3) and the frame was one I'd had (empty) forever. And here's the best shot I could get of the whole shelf. I am SOOO happy with how it turned out and that it's done! The next installment of 'Projects' will feature my front garden area and how my future now holds less weeding/guilt for not weeding. I know you're excited. 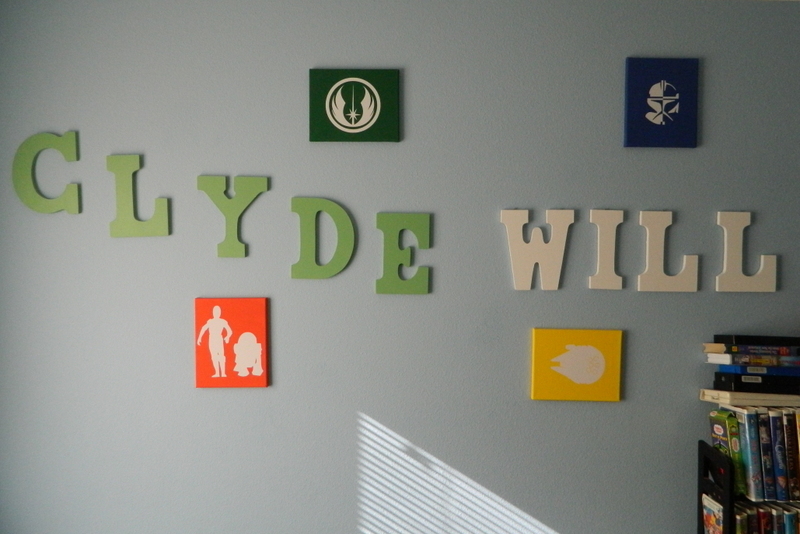 That left me inspired and desiring to cute- up my house. Which isn't actually possible. So it was kind of a downer for me. But you did an excellent job! I wasn't actually sure what a "plant shelf" was when we talked about it earlier, so I'm glad I've got pictures so I now understand the whole process. I LOVE all of your decor!!! 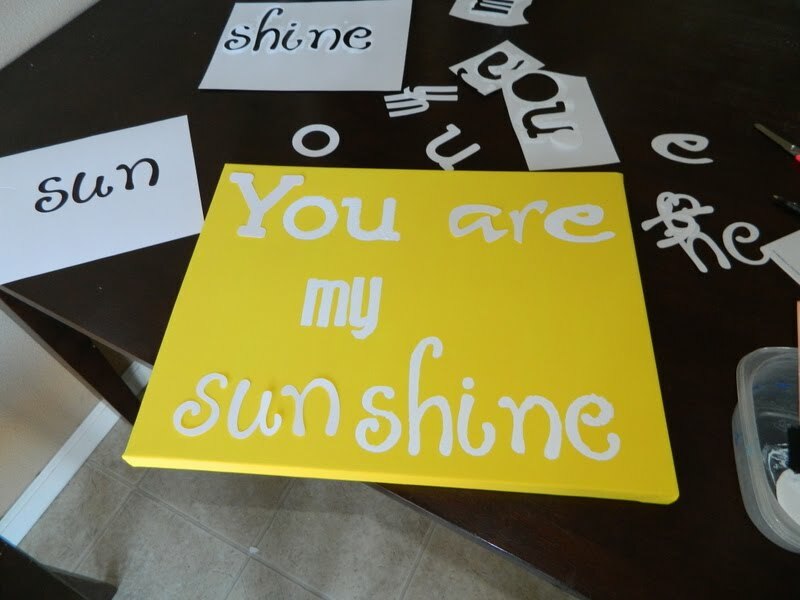 So cute :) Too bad I live so far away or you could come do my house!! The decor looks so nice! Congrats for being able to find something to do with the upper ledge thing. That is a very hard thing to do. Look at you Jana. That looks so great. I love the Canvas idea. I may just have to use that for my kiddos rooms. Oh and I miss you lots. LOVE it!!! Now come and help me decorate. I don't have any kids at home so what's my excuse?! Ok. I love the picture with all of their baby pictures. Way cute idea! Second. 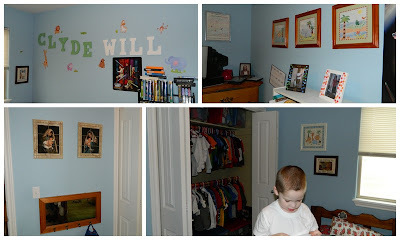 Those boys room looks way good! And I like your ledge, but you already knew that.